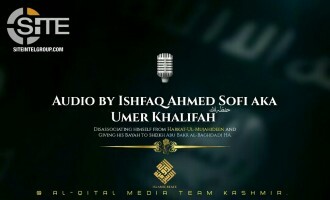 A pro-Islamic State (IS) Kashmir-centric media unit released an audio speech attributed to a Harakat-ul-Mujahideen member disassociating from his group and pledging allegiance to IS leader Abu Bakr al-Baghdadi. 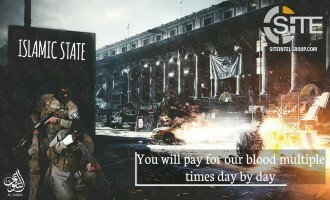 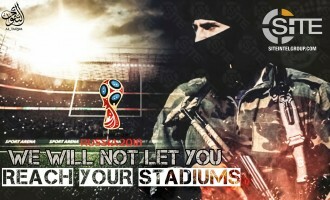 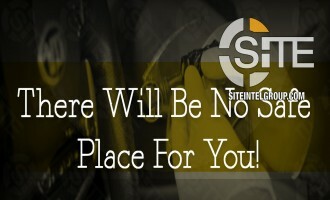 An Islamic State (IS)-linked group used an image from the video game "Tom Clancy's The Division" to threaten revenge attacks in the West. 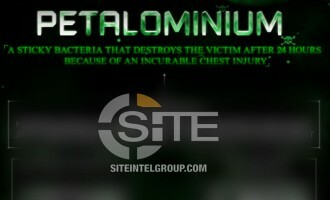 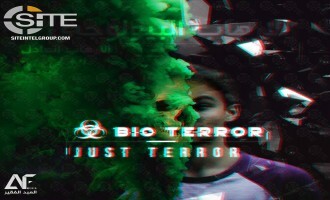 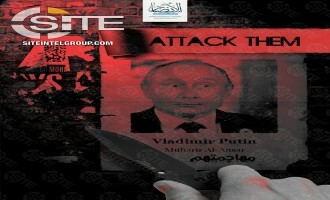 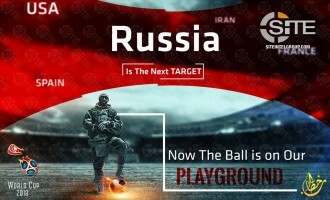 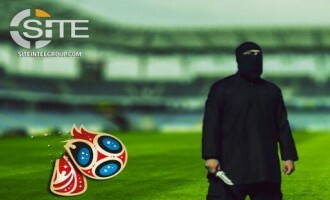 An Islamic State (IS)-linked group continued its promotion of biological terrorism in the West with a second poster just days after publication of video inciting for such attacks. 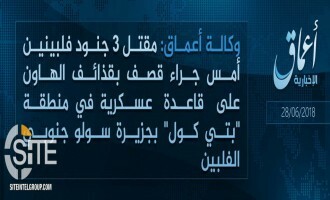 Amidst its ongoing activity in the Philippines, and specifically Patikul district in Sulu, the Islamic State (IS) claimed killing three Filipino soldiers in a mortar strike. 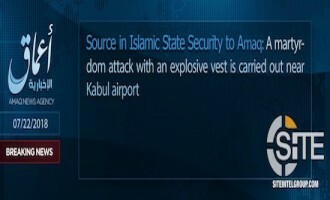 The Islamic State’s (IS) ‘Amaq News Agency reported responsibility for the suicide operation on a welcoming committee for Afghan Vice President Abdul Rashid Dostum at Kabul Airport, killing and wounding more than 115. 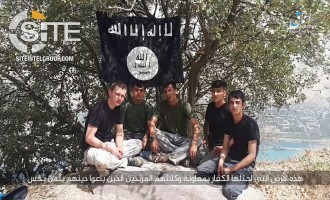 The Islamic State's (IS) Caucasus Province claimed killing three Dagestani policemen in a shooting in the town of Kizilyurt. 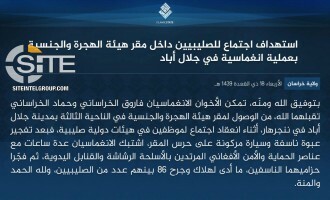 The Islamic State's (IS) Khorasan Province issued a formal communique claiming the suicide bombing on supporters of Afghan Vice President Abdul Rashid Dostum at Kabul Airport. 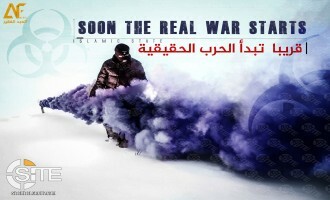 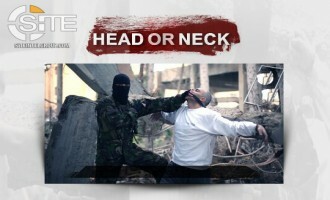 IS-linked Group Promotes Biological Attacks as Precursor to "Real War"
Following its release of a video urging lone-wolf jihadists to cultivate and deploy biological weapons in Western countries, an Islamic State (IS)-linked group promoted such attacks as the precursor to "real war". 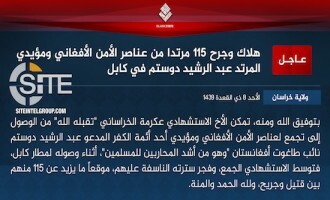 The Islamic State (IS) claimed shooting to death a Filipino soldier in the Sulu Archipelago in the southwestern Philippines. 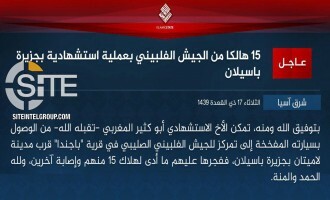 The Islamic State (IS) claimed killing over 15 Syrian soldiers in a suicide bombing in western Daraa and seizing control over several villages in neighboring Quneitra governorate. 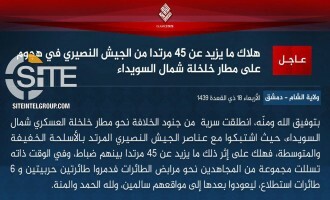 The Islamic State’s (IS) newly established Hauran Province claimed the deaths of 25, and the seizure of several villages, as the result of clashes with Syrian regime and “Awakenings” forces in Daraa. 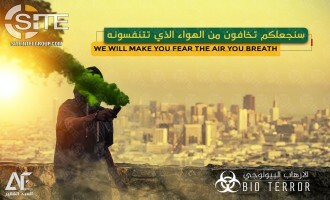 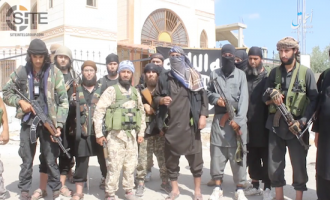 An Islamic State (IS)-linked group released a video urging lone wolves to use biological weapons in Western countries and providing advice as to where to acquire and deploy bacteria. 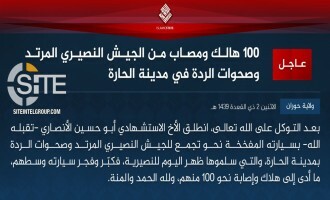 The Islamic State's (IS) Hauran Province in Syria claimed killing and wounding nearly 100 elements from the Syrian army and opposition factions identified as "Awakenings" in Daraa. 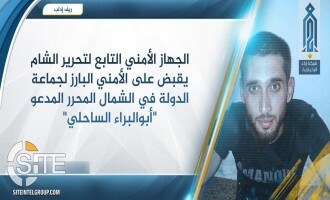 The Islamic State’s (IS) ‘Amaq News Agency and newly established “Hauran Province” released a video and photo report, respectively, showing scenes of the captured town of Heet in Daraa, Syria and renewing the province’s pledge to group leader Abu Bakr al-Baghdadi. 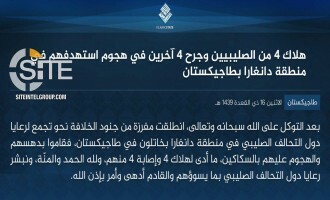 The Islamic State's (IS) Khorasan Province issued a formal communique claiming credit for the suicide bombing on Rural Development Ministry staff in the Afghan capital, Kabul, and threatening more operations on those who assist the "Crusaders". 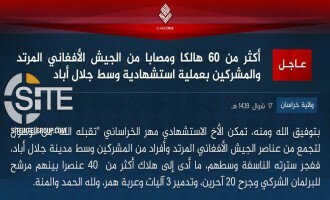 The Islamic State's (IS) 'Amaq News Agency reported 60 casualties among Rural Development Ministry staff in the Afghan capital, Kabul, and noted French nationals among the wounded. 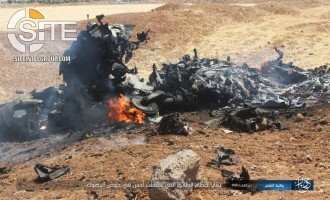 The Islamic State's (IS) Idlib Province in Syria launched against Hay'at Tahrir al-Sham (HTS) and unidentified "opposition factions," a military campaign it dubbed the "Invasion of Brother Abu al-Bara' al-Saheli," a fighter beheaded by HTS. 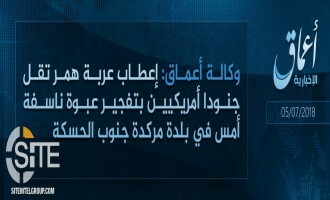 'Amaq News Agency reported that two American soldiers were killed in an ambush by Islamic State (IS) fighters in Nangarhar in eastern Afghanistan. 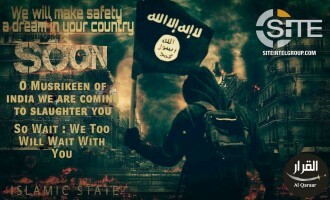 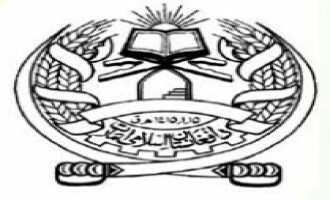 In a discussion on a pro-Islamic State (IS) Telegram chat group, users called for migration to Kashmir, along with regional outreach, to help build a “stronger” IS presence there. 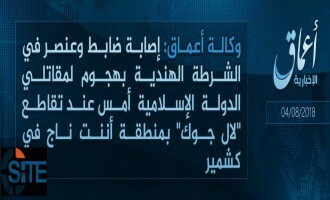 The Islamic State's (IS) newly established "Hauran Province" claimed seizing control over the town of Heet in Daraa governorate in Syria following two suicide bombings and a raid on positions held by opposition factions. 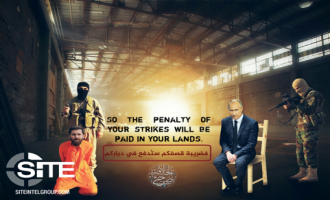 An editorial in the pro-Islamic State (IS) magazine “Anfal” urged Muslim youths to take Hudhayfah al-Badri, son of IS leader Abu Bakr al-Baghdadi, as a role model and eschew worldly pleasures for jihad. 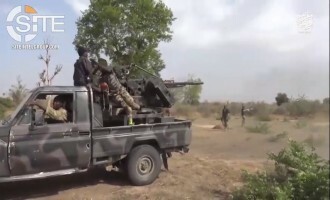 The Islamic State's (IS) Nigeria-based West Africa Province released a video promoting the perseverance of its fighters and displaying footage of suicide bombings and attacks on Multinational Joint Task Force (MNJTM) and Nigerian soldiers. 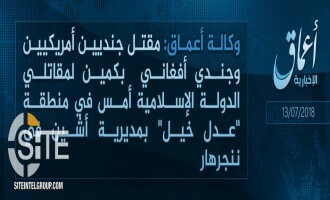 The Islamic State's (IS) Khorasan Province claimed credit for a suicide bombing on Afghan intelligence agents in the capital of Nangarhar, Jalalabad. 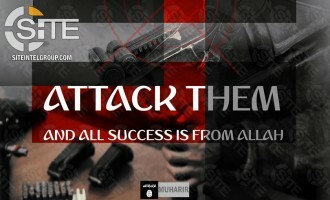 An Islamic State (IS)-linked group advised supporters on attacks involving knives for cutting and stabbing and weapons to inflict blunt force trauma to a victim. 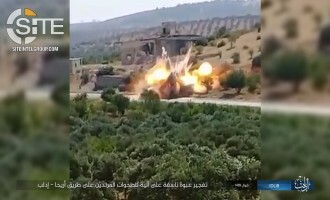 Following the late-June security operations by Hay’at Tahrir al-Sham (HTS) in exposing and eliminating Islamic State (IS) cells in Idlib, the IS has maintained its resurgence in the governorate over the past days, attacking HTS fighters there and also in neighboring Aleppo. 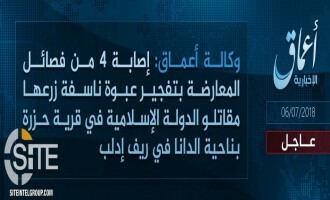 In its first claimed activity in five months, the Islamic State's (IS) Idlib Province in Syria claimed bombing a vehicle belonging to an opposition faction. 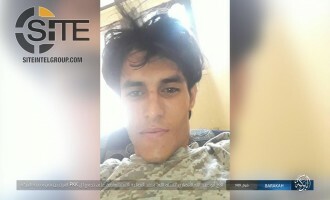 An Islamic State (IS)-linked media unit declared that the death of IS leader Abu Bakr al-Baghdadi's son in a suicide attack quashes questions about the group's intentions and the sincerity of its leaders. 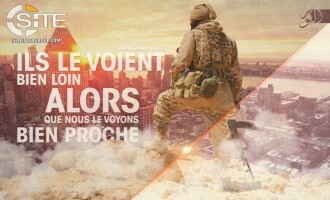 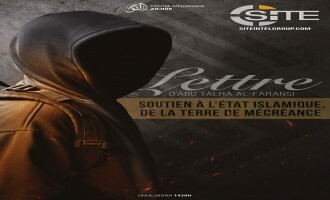 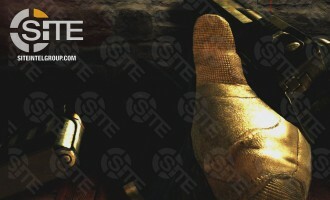 A French Islamic State (IS)-linked media group depicted a gun-toting fighter overlooking Midtown Manhattan to warn of future attacks. 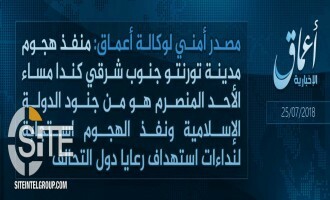 Shortly after its 'Amaq News Agency reported the killing of 20 Filipino soldiers in an attack by Islamic State (IS) fighters in Maguindanao, in the Philippines, the group issued a formal communique for the operation. 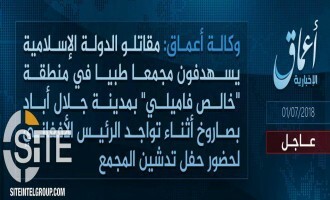 The Islamic State's (IS) 'Amaq News Agency reported that group fighters killed more than 20 Filipino soldiers in an attack in Maguindanao in the Philippines. 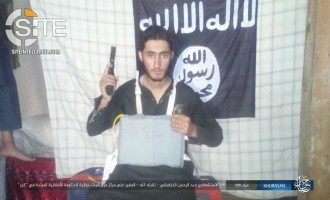 The Islamic State's (IS) Homs Province in Syria announced the death of "Hudhayfah al-Badri," a young man identified as the son of IS leader Abu Bakr al-Baghdadi, in a suicide attack. 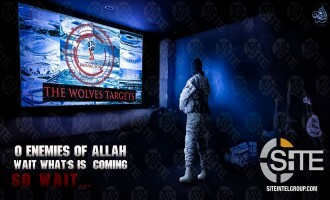 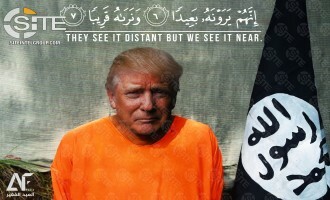 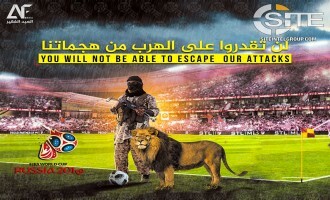 In a poster referencing the 2013 film "White House Down," an Islamic State (IS)-linked group warned that it will happen and "is not a movie". 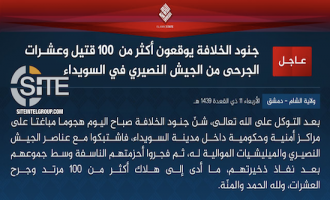 The Islamic State’s (IS) Khorasan Province claimed killing and wounding 60 Afghan soldiers and “polytheists” as the result of a suicide operation in central Jalalabad. 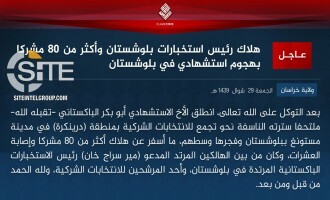 Over the course of two days, the Islamic State (IS) claimed a suicide bombing on Afghan Special Forces, and targeting the inauguration of a medical complex, wherein it reported the presence of Afghan President Ashraf Ghani, both in the Nangarhar capital Jalalabad. 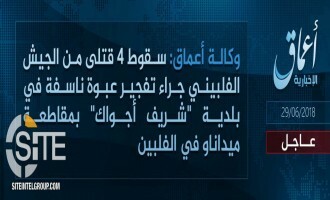 In its third reported incident in the Philippines this month, specifically in the Patikul municipality on Jolo island (Sulu province), the Islamic State (IS) claimed killing three Philippine soldiers via IED. 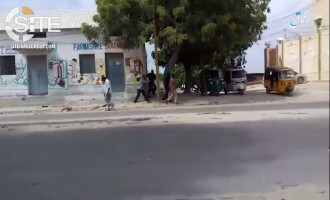 As claimed attacks by the Islamic State (IS) increase in frequency in Somalia, and particularly in the capital, Mogadishu, the group's 'Amaq News Agency released a video showing a fighter brazenly killing two government finance employees on a street in broad daylight. 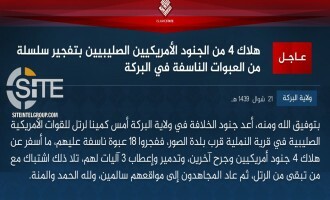 The Islamic State (IS) claimed killing 4 Filipino soldiers in a bomb blast in Mindanao. 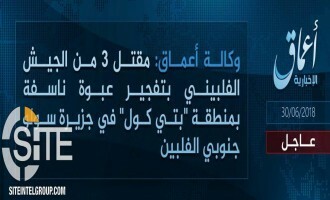 In its second reported incident this month in the Philippines, and specifically in the Patikul municipality in Sulu province, the Islamic State (IS) claimed killing three soldiers in a mortar attack. 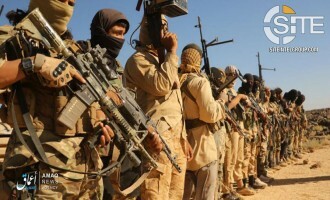 The Afghan Taliban reported that it has killed nine Islamic State (IS) fighters amidst its "large scale operations" against the group in Kunar province in northeastern Afghanistan. 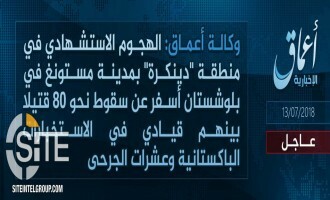 The Islamic State's (IS) Khorasan Province claimed credit for a suicide bombing at an Afghan Local Police (ALP) camp in Kunar. 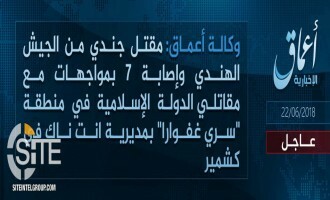 The Islamic State (IS) claimed its first attack in Raqqah, its former capital in Syria, since losing control over it in October 2017. 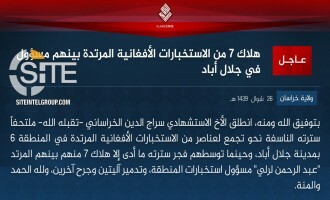 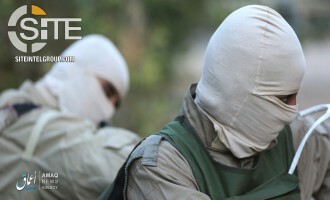 The Islamic State's (IS) Khorasan Province claimed killing one Indian soldier and wounding seven others in clashes in Anantnag district in southern Kashmir. 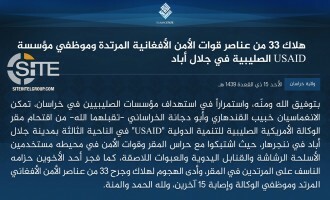 The Afghan Taliban reported that its fighters in Laghman province in eastern Afghanistan have nearly eliminated the Islamic State (IS) presence there, and claimed that U.S. aircraft interfered in its operations. 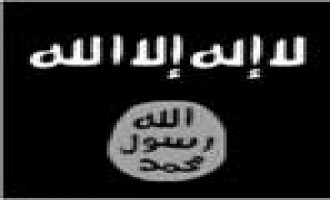 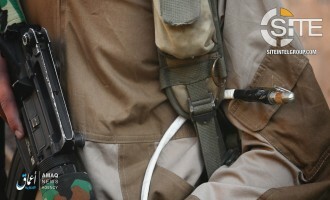 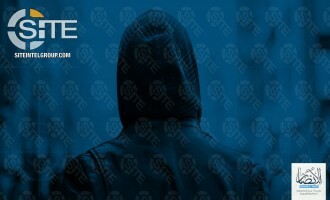 An Islamic State (IS) supporter advised the group to develop its presence in Yemen through infiltrating enemy ranks and establishing finance networks to fund military operations. 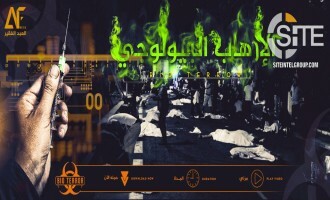 The pro-Islamic State (IS) "Jundul Khilafah Kashmir" released a video for Eid al-Fitr showing members visiting the grave of slain militant Mugees Mir, and a scene with children celebrating the IS.